The poll's release came just a couple of hours before the start of the Conservative Political Action Conference. The three-day event, better known by its initials, CPAC, is the largest annual gathering of conservative leaders and activists, and the issue of abortion is often in the spotlight. But this year, some social conservative leaders have criticized conference organizers for what they say is a lack of emphasis on the issue of abortion. According to the poll, 27% say that abortion should be legal in all circumstances, 13% say it should be legal in most circumstances, 38% say that it should be legal in few circumstances, and 20% say abortion should always be illegal. "Not surprisingly, abortion remains an issue on which there are wide partisan differences," said CNN Polling Director Keating Holland. 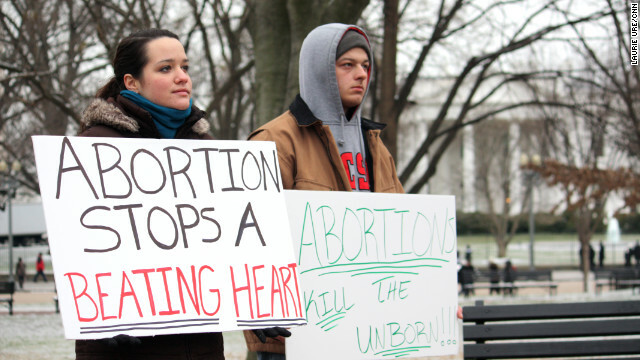 "Republicans are twice as likely as Democrats to say that abortion should always be illegal. But only a minority of the rank-and-file members of both parties take an extreme position on the issue, with just 31% of Republicans calling for a complete ban on abortion and just 32% of Democrats saying that abortion should be legal in all circumstances." Most Americans have never favored using public funds for abortions for women who cannot afford them. According to the survey, 56% remain opposed, with only 39% favoring public funding for abortions. But that sentiment does not appear to extend to government subsidies for health insurance. The poll indicates the public is split right down the middle, with 49% saying that women who receive government subsidies for health insurance should be able to get a plan that covers abortion services and an identical 49% disagreeing. The Republican-controlled House passed a bill in late January banning abortion coverage in federally subsidized Obamacare plans. But the measure stands little chance of getting a vote in the Democratic-run Senate. The poll was conducted for CNN by ORC International from Jan. 31 through Feb. 2, with 1,010 adults nationwide questioned by telephone. The survey's overall sampling error is plus or minus three percentage points. I don't believe this poll one bit but if the teaklans want to keep women, excuseeeeee me hosts, from having babies maybe they should allow women the same access to contraceptives (sometimes even free!) as they do men for Viagra, Cialis and those testosterone deodorants. See how simple that would be? The religious right seeks to impose their will and their ideology onto the rest of the country. They infiltrate political organizations for that singular purpose. How about a poll that asks JUST women? Bet ya republicans ain't gonna like that one! Interesting that CNN uses Republicans to get there facts. Republicans continue the squeeze on abortions and making women risk their lives now. More women will die without the proper care and safe abortion. But Republicans don't care about life. They are the mass killers with the laws and bills they pass in the states. They have no regard for women nor do Republican women. Republican women are as radical as the males. I think an outright ban on all abortions is already settled law, Roe v. Wade. Why would conservatives waste legislative time and taxpayer money passing bills, which are strategically written to be constested in court, in the hopes that they can overturn the Supreme Court's decision. Central to the problem is that many people are quick dismiss the medical science and data on the subject, basing their arguments on "moralities and values". Nothing wrong with that. The problem, though, is making the entire argument all about your "moralities and values" and nothing else. At some point we have to look at what we about life from a scientific point of view. Which reminds me. I just some state is trying to pass a law outlawing abortion after a heartbeat can be detected. Im pro- choice, but it should be the on the two who did the deed to pay for the abortion. What one chooses for one's self, should not dictate to what others should/not do for themselves. Wow that is good news the same poll 25 years ago put abortion almost 10% more favorable. I think it was around 23 % for most abortions are ok now that's good news.